The democratization of Skype (and other VoIP services, too) continues with Logitech PC EasyCall Desktop, making Internet phone calls easier than falling off a log. 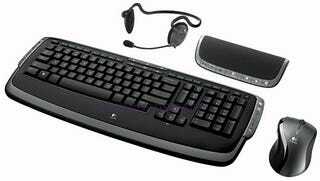 The set includes a keyboard, mouse, headset and speakerphone, and the keyboard includes extra buttons for launching Skype, placing and ending a call and other functions. Plus, the F9 through F12 keys serve as speed dial number for your go-to associates. Logitech says the speakerphone is full duplex and includes what it calls "RightSound Technology," promising a echo-free phone call and the ability to tell when someone's interrupting you. Good luck with that—we haven't seen a speakerphone that does a perfect job of that yet. That speakerphone also acts as the control center, giving you control of volume, pick-up and hang-up. Available in about a month, the set will retail for $130.